Pieced together from various histories found in HCLC files. During the summers of 1852 and 1853, Nils O. Brandt, a Lutheran Minister located in a parish twenty miles East of Madison, held missionary services in the Halfway Creek area for three months each summer. Brandt’s missionary work was continued by the Rev. Hans A. Stub. Rev. Hans A. Stub organized a congregation in Halfway Creek on October 14, 1856. In the same year, Pastor Stub also organized congregations in Lewis Valley, La Crosse Valley, and Bostwick Valley. In the same year, the trustees of the four congregations met and formed a parish with one pastor. In 1856, the four congregations purchased a farm of 120 acres in Section 4 with a good log house on it from Peter A. Bjugstad for $800.00, which became the parsonage farm. In 1860, a two-story house was built at a cost of $1,500.00, replacing the log house. This parsonage burned in 1865, but was rebuilt in 1866 at a cost of $2,560.00. A short time later, an addition to the west side was made to parsonage. This completed house was used continuously as a parsonage until 1914. Valley was used the most. Services were held once a month the first four years. However, with the completion of the 1860 parsonage a resident pastor came and held services once every two weeks. In 1861 the congregation was incorporated under the laws of the state. Papers were filed in the La Crosse County Courthouse, at a cost of fifty cents. Rev. P. L. Larsen was the pastor serving the congregation at this time. The official name of the congregation was listed as the Norwegian Evangelical Lutheran Congregation of La Crosse County. On June 17, 1861, Pastor H. A. Preus of the Synod came to investigate with the four congregations the possibility of using the parsonage for a university-school. That fall, the 1860 parsonage opened its doors as the first college among the Norwegians in the United States, becoming the cradle of Luther College. Luther’s first school year was conducted September 1861 – June 1862. The Rev. Peter Laur Larsen served as the first pastor-instructor. The Rev. F. A. Schmidt assisted him in the teaching duties. During the academic year the students walked four miles over the hills from Luther College to attend church services once every two weeks at the schoolhouse near Sam Hendrickson’s home in Lewis Valley. During the year ending June 1862, a total of sixteen students attended the college, eleven of whom had attended at one time. In 1868 the congregation built and dedicated its first church. It was a white frame building, 38’x50’, a few rods south of the parsonage in the front part of the cemetery. It was constructed at a cost of $3,500.00. In 1870, the congregation split to give birth to an independent congregation in Onalaska. On March 17, 1886, the church was re-incorporated and the name changed to “The Scandinavian Evangelical Lutheran Congregation of Halfway Creek” out of courtesy to the Swedish descendants residing in the community. On February 21, 1887, the Norwegian Evangelical Lutheran Congregation of Bostwick Valley deeded its share of the parsonage farm to the other three congregations, Halfway Creek, La Crosse Valley, and Lewis Valley, for $266.40. In 1893, Lewis Valley built their original church, which was destroyed by fire December 16, 1976. On September 4, 1907 The Norwegian Evangelical Lutheran Congregation of La Crosse Valley deeded its share of the parsonage farm, forty acres, to the two remaining congregations for $1,500.00. Services were held in the 1868 church until April 13, 1912, when lightning struck the church and destroyed it by fire. It was then decided to relocate the church and a site was purchased February 26, 1913 from Abner Smith in Sweden Coulee for $100.00. On this hill a large brick church was completed in 1914 at a cost of $10,000. Cheer us with thy merry ringing. Early settlers of the village of Holmen and vicinity attended services at Halfway Creek. Due to distance and difficulty of travel much of the year, it became apparent that there was a need for services in Holmen. For some time worship was conducted in the town hall. 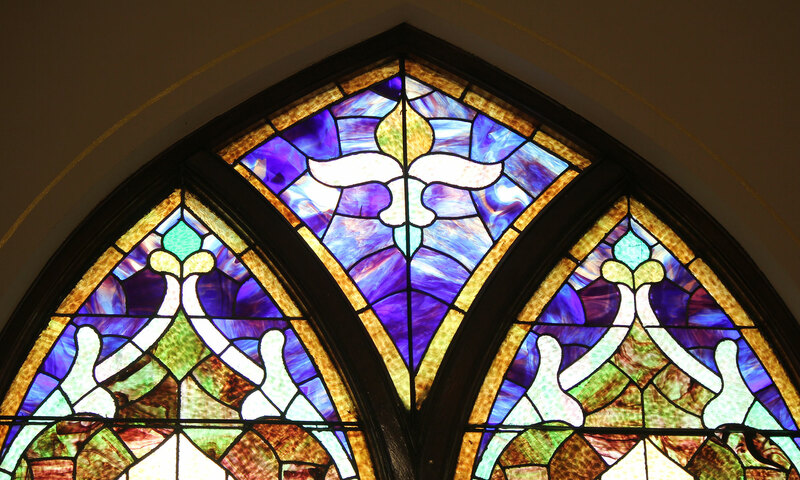 In 1907 a Lutheran congregation was formed with the church completed and in use by 1909. In 1914 the two congregations, Halfway Creek and Lewis Valley, decided to purchase a site for a new parsonage in the village of Holmen and the Trustees purchased a house and two lots on the corner of Clyde and Morris Streets, from John Gaarder for $3,000.00. This became the parsonage. As there was no further need for the parsonage farm, it was sold March 5, 1915 by the two remaining congregations, namely the Norwegian Evangelical Lutheran Congregation of Lewis Valley and the Scandinavian Evangelical Lutheran Church of Halfway Creek to Emil Knudson for $7,000.00. This sale, however, did not include the cemetery, containing about two acres, which was a part of the original parsonage farm. In 1955 Lewis Valley realigned with Mindoro Lutheran. Holmen Lutheran and Halfway Creek became a new two-point parish. In 1975, Halfway Creek and Holmen voted to split the parish and became separate congregations. On January 26, 1986, the present parsonage was dedicated. In the late fall of 2004, the congregation restored its sanctuary to a style consistent with the architecture of the building. The work was completed by Richie Brothers Studios. In December 2004 Bishop April Larson preached and presided at a worship service of rededication. In 2004 and 2005 the congregation established a separate (legally defined) cemetery association. All land and assets were transferred to the association.